Raelene Gold may have grown up in Seattle’s Capitol Hill neighborhood but she gained a fondness for the outdoors early on—salmon fishing with her dad, berry picking in the Cascades, canoeing on Hood Canal—and later developed an overwhelming sense of duty to protect it. Her pursuit of environmental justice began in 1989 when she worked with Seattle Audubon to save ancient forests and continued with organizations like the League of Women Voters, for which she led efforts to protect public lands, river systems and forests from destructive wildfires and logging practices, and the Federation of Western Outdoor Clubs, where she served as president and continues as editor of its newsletter, Outdoors West. Most recently, as a member of Great Old Broads for Wilderness, the retired psychiatrist and Lake Forest Park resident has supported that organization’s effort to sue the president of the United States. At the end of last year, the Great Old Broads joined nine other environmental organizations and filed a lawsuit against the current administration, citing what they believe was an unconstitutional decision to eliminate some of our national monuments. Of this national grassroots organization, which has worked to preserve and protect wildlands for nearly 30 years, Gold notes that it’s “fun, zany and creative” (as is evident by the cheeky name). Often, organizations are either fun or effective, but Great Old Broads, she says, is both. Gold has worked with the Olympia-based chapter, Polly Dyer Cascadia “Broadband,” since 2013. But in July, Great Old Broads is bringing a new chapter to Seattle. Gold predicts that the city’s rapidly growing population, tradition of environmental advocacy and a newly mobilized base of activists (especially women) concerned over threats to democracy, will help it thrive. Gold may have retired from practicing psychiatry, but don’t expect her to stop fighting for a safer, cleaner world anytime soon. 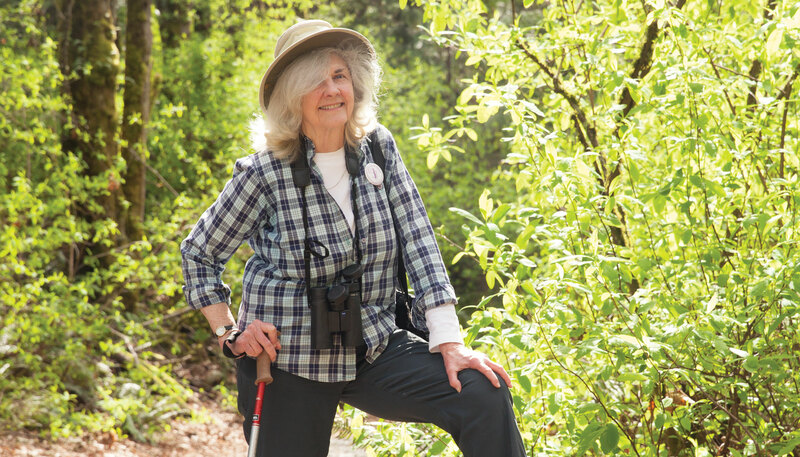 At 80 years old, the intrepid environmentalist still sees so much more work to be done. “I feel a sense of responsibility as long as I’m able. I love the land [and] I feel very committed to the preservation of it,” she says. Getting people outside in nature is the best way to combat apathy when it comes to the environment, says Gold. “We have rapid access to the Cascades, Puget Sound...stunningly beautiful places. If it’s localized, then they’ll care about that place,” she believes. Gold will join other Great Old Broads August 12-16 for the North Cascades Adventure in North Cascades National Park—an event in which attendees learn about a specific area and its needs. Learn more at greatoldbroads.org.